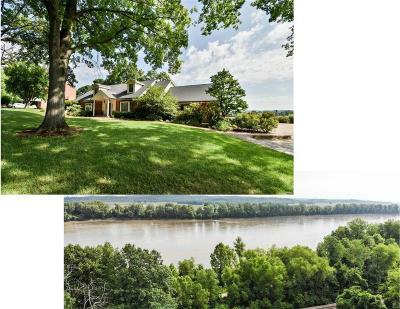 Welcome to one of Washington's finest homes with views of the Missouri River. Step inside this beautiful full brick custom built home. Over 4500 square feet of quality construction featuring an antique walnut staircase from the first City Hall. Brick fireplaces with wood mantles made from fallen trees on this property. Master suite features an antique marble fireplace and custom master bath with jet tub, large separate shower and vanity. Custom kitchen with wood cabinets, granite counters and island with bay window seating overlooking the river. Step inside the stunning sunroom and enjoy your morning coffee all while watching the wildlife and the barges on the River go by. Lower level has been finished with antique wood doors as paneling. There is an antique wet bar and wood ceiling with walk-out to aggerate patio and inground pool and sport court all with views of the Missouri River. Only forty minutes from Clayton. Call today for a tour of this spectacular home! Elementary School: South Point Elem.